As the temperatures drop and the nights grow cooler, you may be looking for ways to stay warm inside without going through your entire heating budget before the snow begins to fall. While things like space heaters and fires can quickly make a room feel comfortable and toasty, it is important to use them sparingly and safely to prevent a larger fire from breaking out. October is Fire Prevention Month, so make sure you follow these tips to keep your home and family safe. If you are smoking a cigarette or have a fire going, make sure they are completely out before leaving the house or going to sleep. Even if the embers are nearly out and only smoldering, a gust of wind through the chimney or an open window can cause things to shift, potentially onto flammable materials. A fire doesn’t have to just start in the kitchen or near a fireplace. Make sure you have memorized at least two ways out of each room in case a fire breaks out and cannot be contained. 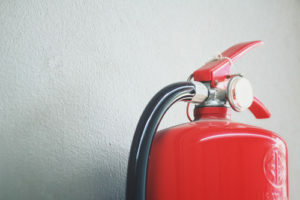 A small fire extinguisher can make a world of difference if a small fire breaks out. If a grease fire starts in your kitchen, make sure you have a large, metal pot lid handy. Water will only exacerbate a grease fire and cause it to spread. Your frayed, damaged charger may still be able to get energy through to your phone or laptop, but as the exposed wire heats up, the risk of sparking increases. As soon as you start to notice fraying on a cord, it’s time to replace it. If a cord is fraying on a lamp or heater, a professional will be able to replace it safely. If you experience a fire and are in need of emergency response or structure stabilization, contact Boston Board Up Services. We will arrive with fire and medical personnel responding to the scene and begin working as soon as the situation is contained. Boston Board Up Services can be reached 24 hours a day at (800) 949-9113, or you can fill out our contact form.